Snails naturally secretes slimy mucus/snail extract (Helix aspersa muller glycoconjugates) to protect themselves from cuts, bacteria, and UV ray. This protective slimy mucus is enriched with beauty enhancers such as hyaluronic acid, glycolic acid, elastin, glycoprotein enzymes, anti-microbial, copper peptides, and various others. In ancient Greece, snail mucus was applied on wounded or burned skin to enhance skin healing. Currently, snail mucus is used to prepare serums, facial masks, moisturizers, and fading creams, which are mainly used to treat dry skin, wrinkles, stretch marks, acne & rosacea, age spots, burns, scars, razor bumps, and flat warts. Factors such as increasing inclination of mid age population towards grooming, shifting preference towards natural skin enhancing ingredients, and favorable growth of snail farming are major factors driving growth of global snail beauty products market. Among product type, anti-ageing cream segment generated highest revenue in global snail beauty products market in 2016. The segment is expected to lead the market over the forecast period. Snail mucus stimulates the formation of collagen and elastin, which repairs damaged skin and restore skin hydration. Increasing demand for snail creams especially from mid-age population is the prime driver for the growth of this segment. According to United Nation survey, about 65% of world population is under age group of 15 to 64 years. Such huge population base is creating positive environment for growth of anti-ageing cream segment. Asia Pacific held highest revenue share in the global snail beauty products market in 2016 and it is projected to maintain its dominance throughout the forecast period. In Asia Pacific, South Korea contributed highest revenue share in the regional market. Shifting consumer preferences towards natural skincare ingredients fuelled by favorable growth of cosmetic industry in the region is bolstering growth of snail extract based beauty products. According to South Korean government, South Korea is the eighth largest cosmetic market in terms of sales in the world. Moreover, increasing popularity of snail spas in Thailand, Korea, and Japan is boosting demand for snail beauty products in the region. North America region is expected to be the fastest growing region, witnessing CAGR of 11.23% over the forecast period. In North America, the U.S. is projected to witness significant growth in the regional snail beauty products market over the forecast period. Increasing focus of leading players to tap potential market in association with local retailers in North America is expected to have positive impact on growth of regional snail beauty products market. CVC Pharmacy, a subsidiary of American Retail and Healthcare Company CVC Health began to promote K-Beauty HQ, which contain more than 100 South Korea beauty brands including snail creams & gels at 2100 stores in April 2017. According to a study by Coherent Market Insights, the global snail beauty products market was valued at US$ 338.3 million in 2016 and is expected to reach to US$ 769.5 million, by witnessing a CAGR of 10.82%, in terms of revenue, over the forecast period (2017 – 2025). Anti-ageing creams segment held highest revenue share of 33.25% in the product type and the segment is projected to maintain its dominance throughout the forecast period. 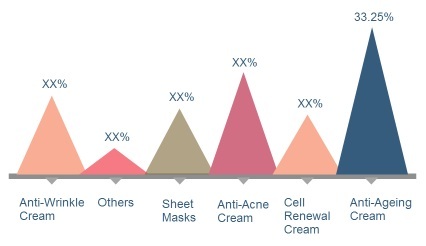 Cell renewal cream is projected to be the fastest growing segment in the market during the forecast period. The major players operating in the snail beauty products market include Mizon, COSRX, KENRA Professional, DRAN Co. Ltd., Owlcare Co. Ltd., and Laboratories Portugal S.R.L. Key players are strategically investing in the snail beauty products market to enhance their product portfolio. For instance, KENRA Professional has developed snail extract based hair care products such as anti-aging shampoo, anti-aging conditioner and cream, which are formulated without sulphates, parabens, and sodium. Snail beauty products are gaining popularity as an effective skincare solutions due to natural antibacterial and antiviral properties of snail extract. These products are manufactured by incorporating snail extracts with other natural bioactive ingredients such as vegetable oil, seed oil, and various others for curing acne & ageing problems. Variety of snail beauty products such as cell renewal cream, anti-acne cream, anti-ageing cream, anti-wrinkle creams are easily available in mass merchandiser/retail stores. The growth of global snail beauty products market is driven by increasing demand for snail extracts in variety of skincare products due to medically proven enormous health benefits such as treating acne scarring, moisturizing, and various others. Based on product type, anti-ageing creams held highest revenue share in global snail beauty products market during 2016. The grooming trend to look younger in both men & women is driving growth of anti-ageing creams over the forecast period. Asia Pacific dominated in global snail beauty products market in 2016 and the region is projected to maintain its dominance throughout the forecast period. Increasing demand for snail extract enriched products for curing acne problems in Asian economies and bulk availability of snails in the region are some of the key factors, which are projected to fuel growth of regional snail beauty products market. North America is expected to be the fastest growing region in market throughout the forecast period, owing to rapid adoption of snail extract based skincare creams. Key companies covered as a part of this study includes Mizon, COSRX, KENRA Professional, DRAN Co. Ltd., Owlcare Co. Ltd. and Laboratories Portugal S.R.L. among others. *Browse 200 market data tables and 70 figures on "Snail Beauty Products Market - Global forecast to 2025”.